Tell Congress: Save our National Monuments! Congress has a critical role to play in the fight to stop President Trump from eviscerating protections for our national monuments and wild places — and selling them out to fossil fuel, logging, and mining companies and other destructive industries. Tell your senators and representative to urge Trump to end his assault on our public lands and offshore waters and protect our national monuments for the American people, not polluters. 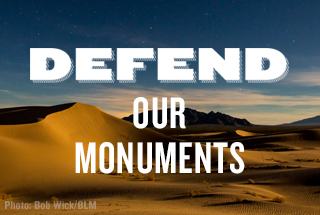 Tell congress to help fight back against the Trump administration’s attacks on our public lands and waters and defend our national monuments from destruction. Dear Senator or Representative: Please urge President Trump to stop his reckless giveaway of America’s cherished national monuments to fossil fuel, logging, and mining companies and other destructive industries. Your constituents rely on national monuments, from the San Gabriel Mountains in California to the Northeast Canyons and Seamounts off the coast of New England, for peaceful escape and adventure. But we also depend on these wildlands to protect our threatened wildlife, majestic landscapes and cherished coastal waters, and cultural and historic sites vital to indigenous communities that have thrived there for thousands of years. Trump’s move to sell out our public lands and waters is nothing less than an assault on our natural heritage and the Antiquities Act itself. Lawmakers like you can help stop this assault -- by demanding that the president reverse course and protect our national monuments and wild places for the American people, not polluters, today and for generations to come. Please do everything you can to stand strong against Trump’s assaults. Thank you. Title / Prefix* Title/Prefix* Dr. Miss Mr. Mrs. Ms. Mx. Prof. Hon.